Puja is a ritualistic, customary way to venerate the Divine. Pujas are traditionally performed at temples, homes or at office premises by trained Pundits. Conducting a Puja has numerous benefits - it helps propagate positivity, vanquishes negativity, helps to wash away sins and cleanses a devotee's Karmic cycle. Pujas are done in many forms - through Japa, Yajna and Homams. Pujas are a medium using which devotees connect with the Divine consciousness. A Puja done completely in the Vedic way can be complex. It will require numerous various puja articles and chanting of Vedic texts and mantras. Pujas may be conducted for various purposes such as for success and prosperity, for peace and harmony and to achieve success in career or to be blessed with a child. If a Puja is done in a proper way, it can help you to connect to the God, and while offering prayers, the God draws closer to the disciple. Hence, Puja is a two-way motion that brings the devotee and the God closer. Pujas are done on a daily basis or on special occasions by devotees. For maximum benefits, Pujas should be conducted in the same way mentioned in ancient Vedic texts. Pujas can lead a devotee to spiritual upliftment and help overcome sufferings, and help bring success, materialistic prosperity, peace and harmony. Lord Sudarshan is worshipped primarily for good health, protection in all spheres and for relief from various diseases and ailments. Sudarshan is the personification of the Discus held by Lord Vishnu. It is representative of the all-pervading Cosmic Mind. 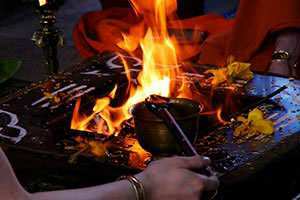 The ritual can also be used as a type of exorcism which removes elementals and other troublesome astral entities as well as counteracting curses and spells. Therefore performing Sudarshan Homa relieves you from afflictions of fever and unknown health sufferings. When to Perform: Ekadashi, Dwadasi and Pournami Tithis that fall on Wednesdays and Saturdays, during the Budha Horas. One on of the most dreaded malefic effects planets is Kaal Sarp Dosh that emerges when all the planets in your horoscope are situated between Rahu and Ketu. If you are born under Kaal Sarp Dosh, you would certainly live with struggles even after putting genuine efforts. This results in failure and depression, often attracting negativity and inferiority complex. Complete Kaal Sarp Yoga is formed only when half of the chart is unoccupied by planets. For individual suffering from Kaal Sarp Dosh success is hard to come by and their financial position remains weak. Kaal Sarp Dosh can be of two types namely ascending and descending and can cause various problems such as loss in business and family problems. A person under the affliction of this dosh leads a life of pain and misfortune. If it is highly afflicted this dosha can even invalidate rewards offered by favorable planets. This dosh affects the native till 55 years and sometime throughout his life. Therefore it is better to perform Kaal Sarp Dosh Nivaran Puja under able and qualified Brahmins. Mahamrityunjaya Mahadev is the conqueror of death. The Mahamrityunjaya Mantra helps overcome all sorts of negativities, fears and induces a deep spiritual self-realization. Shiva is the Soul and prayer to Him makes one realize the eternity of self and thus removes the fear of death. The Maha Mrityunjaya Mantra is hailed by the sages as the heart of the Veda. Maha Mrityunjaya Puja is done for a long and healthy life and to get rid of prolonged sickness, especially for those on their death bed. The worship of Dasmahavidya provides fulfillment of materialistic desires and spiritual liberation. The Ten Mahavidyas are known as Wisdom Goddesses. The spectrum of these ten Goddesses covers the whole range of feminine divinity, encompassing horrific Goddess's at one end, to the ravishingly beautiful at the other. Mahavidya means (Maha - great; vidya - knowledge) Goddesses of great knowledge. These Goddesses are Mahavidyas - the ten forms of Shakti. The ten Divine Goddesses are: Kali, Tara, Shodashi, Bhuvaneshvari, Chinnamasta, Bhairavi, Dhumawati, Bagalamukhi, Matangi and Kamala. This Puja is performed especially for inviting auspiciousness and abundance in to ones life. All the Deities for good fortune, wealth, obstacles removal and aiding work and business are worshipped. Deities like Ganesha, Lakshmi, Kuber etc. remove obstacles, bless riches and increase in wealth. Lord Ganesha is the God of Success in all ventures and undertakings. 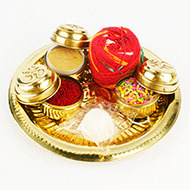 Goddess Lakshmi is the Goddess of Wealth and Prosperity and Kubera is the custodian of wealth. The Puja helps in removal of obstacles, attraction auspiciousness and increase good fortune. Goddess Baglamukhi is acknowledged as the divine power or Shakti of cruelty. She is described as the Devi with three eyes, wearing yellow clothes and gems, moon as her diadem, wearing champaka blossoms, with one hand holding the tongue of an enemy. She is worshipped for power, victory, protection againts cuts, scars, operations and accidents and dominance over enemies. She helps achieve success in law-suits and competitions as well as pacify quarrels to the worshipper's advantage. Her worship is also effective in warding off evil persons, spirits and Yakshani. Goddess Pratyangira Devi originated from Shiva's third eye and is a combination of lion and human forms, which symbolizes balance between good and evil. Pratyangira Devi is the powerful, ferocious and profound aspect of the divine mother who calmed Narsimha (an incarnation of Lord Vishnu) who slayed the demon king Hiranyakashipu. She is worshipped for curing various illnesses, sufferings and negative influences. The Pratyangira Devi Puja, Mantra Japa and Homa are a powerful homa for relief and protection from various negativities such as witch-craft, black magic, diseases and misfortunes. The Pratyangira Devi Puja, Mantra Japa and Homa are performed on Amavasya and Pournami and provide protection and prosperity. Puja samagri includes lemon, dates, crystal sugar (kalkandu), banana, ghee and flowers. The lemon kept at Pratyangira Devis feet during the Puja is then kept in homes for protection and to attract prosperity.